Last semester, I taught a group of Advanced Year 8s Latin at a local secondary school. There were about 30 students in total, all with varying degrees of enthusiasm for what I was teaching them. I’ve been out of the normal school system so long I forgot what it was like to be a rambunctious, carefree thirteen-year-old. Even though I am only seven or eight years older than them, they insisted upon calling me ‘miss’ which felt very weird and formal considering I’m not a teacher but I suppose it is hard to break the habit when school social customs dictate respect for superiors. I think my favourite part of teaching last year was when students asked me questions about Latin. They constantly tried to find links to what they were learning: one girl said she did Latin dancing, and I had a hard time explaining to how that came about. One boy (consistently) kept asking if I could speak Latin, to which I had to tell him that no, I could not; I can only read and translate it; to which he replied something along the lines of “what’s the point?” which sparked useful discussions. It was great to be able to share my enthusiasm for Latin with the children and introduce them into something new and completely different to what they’re used to. Hopefully I was able to inspire some of them, if not with the Latin language or Romans, with the possibility they have to further their education through A-levels and University one day. During my last semester at university I took part in the teaching Literacy through Classics module. I was very eager, as I had always wanted to pursue a career in teaching upon completion of my degree. Admittedly after attending the teaching conference in the semester before the last, I felt daunted at the prospect of teaching a class and actually being the teacher. However by the time of the first class, nerves had turned into anticipation and excitement. I was so excited to see how I and my fellow student teachers would do in our first class together. We had been over and over the lesson plan, making sure we all knew our cues and what topic we were teaching. Finally, it was time to teach. On entering the class and seeing the students looking at you, it was quite frightful: frightful that you and the fellow teachers were going to be the ones teaching them ancient Greek. Nerves dissolved quickly though. As soon as we started asking what they knew about the Greeks, which was a lot, we could see their enthusiasm and excitement for the subject, especially when we taught them how to spell/write their name in the Greek script. The weeks moved on, and my passion for teaching grew stronger with every lesson. We had our lecture and group meeting on a Wednesday, where we would discuss different teaching techniques and theories. After these meetings I always left eager, wanting to implement these new ideas that we had just been taught. The class were steadfast in their Greek learning. We may have had only six students, but it was great to see them turn up every week. 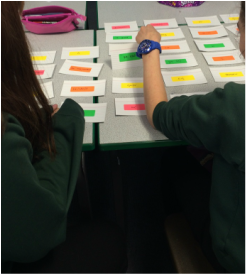 It was also inspiring to see the class so happy when they started to understand how to translate and use Greek verbs. They were also filling in adapted Greek myths using the Greek language. It was fantastic to see how fast their acquisition for the language was. One of my favourite lessons had to be the second last. This class was dedicated to revision for the test the week later. 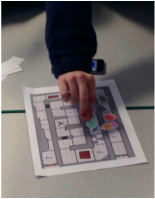 We had decided that this was going to an interactive class with a student-led approach, so we created games for them! We had articulate, pairs, a board game on Theseus and the Minotaur, and a scatter game on Quizlet. The class was a hit and the fun revision went down a treat. We were so pleased by how much the students had learned and retained. It was brilliant! The class was definitely energetic; the impressions of mythological figures in articulate were spot on. And I do not think I can stress enough how competitive students become, especially on Quizlet. A competition had started and everyone was trying to get the fastest time on the scatter game. It was a frenzied battle to win. The whole experience of this module in teaching has been fantastic. It was wonderful to see how understanding Greek grammar helped in the understanding of English grammar. The whole experience was extremely worthwhile, and it helped me understand what it is to be a true teacher. I will definitely take all experience that I have gained and use it in my future teaching career. And never forget, a hippopotamus is a river horse! The lesson which left a lasting impression on me was the second lesson we taught, on Roman and Celtic home life. We decided to bring the ancient world to the class by dressing up in both Roman and Celtic clothing. This lesson was great for the pupils who really enjoyed questioning the visiting Celt and Roman, and also for me as teacher, as the pupils were asking questions for themselves rather than needing us to prompt them. This interactive lesson made such an impact on the pupils that they kept on asking us each week where the Celt and the Roman had gone. This made me very happy as it was clear we had made an impression on them. Another lesson I really enjoyed was the one I planned myself. This may be because I spent a lot of time working on it. It left me satisfied that a lesson I had planned and done the work for was enjoyable and educational. This was particularly true for the storyboard pupils had to create about their own Roman god. A special needs pupil had spent a lot of time on his storyboard and went to present it on his own to the class, winning the competition which we had set. This experience made me really glad to have taken part in the module. Over the last three months I have had the pleasure of teaching at a local Primary school. Though it was part of a module I have actually enjoyed the experience to the extent that myself and the other members of my group have requested to return to the school in a teaching capacity in our own time, as not only have we enjoyed ourselves whilst teaching but also developed a distinct bond with our class. The class themselves were fantastic and nothing similar to what I expected from Key Stage 2 pupils. The maturity and inquisitive nature displayed by the class made them an utter pleasure to teach and interact with, whilst their enjoyment of each class only spurred me on to try and improve my style and ability as a teacher to further their learning and understanding of the subject. In all honesty the part of teaching I most enjoyed was interacting with the pupils of the class while they were working and being able to answer their often insightful questions about what they were learning. I found this particularly satisfying as it meant that what I spoke about was remembered relatively well by the class. When quizzed on it later in the lesson or the following week, it would be easily recalled by the class. This obvious concentration that the class as a whole paid me made me feel as if my efforts were producing results and improving the learning of the class which encouraged me to spend more time on creating enjoyable, fun and diverse lesson plans for the class’ enjoyment. I cannot pick out a single favourite class, though I have narrowed my choice down to two. 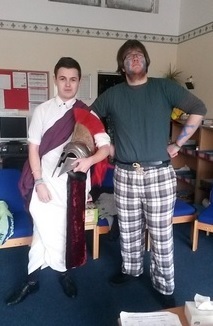 Early on in our time at Glyncorrwg, in an obvious attempt to gain favour with the class, myself and my course mate Harry dressed up as a Roman and a Celt. By pretending that we had come from a time machine in the school we assumed the aliases of Titus the Roman and Wollos the Celt. Though it took a large amount of time to convince the class that I was in fact a Roman and that ‘Tom’ had gone to Roman times to fill in for me whilst I was gone, Harry had no such trouble as I had covered him from head to toe in blue body paint and as such the class had no idea who he was and assumed he was a Celtic warrior. 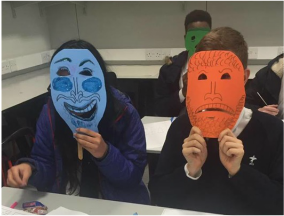 The arrival of these two members of rival nations created a rather funny divide in the class, between those who thought Romans were better and those who side with their blue painted teacher in disguise. This rivalry presented an opportunity for debate within the class, with one side trying to come up with reasons as to why the Romans were better and vice versa, whilst all the while Harry and I circulated gleefully stoking the fires of this ancient rivalry. The benefit of us dressing up was that the children were thoroughly engrossed in the activities we provided them as they were desperate to prove their chosen side the winner. It also made the lesson far more interactive as it granted the class a chance to talk to ‘real’ people from the time period they were learning about and ask them questions to gain a greater understanding. It was not only fun for the class but also for us teachers as the lesson became more interactive and less about standing at the front of the class talking. My other favourite lesson was the first of the two in which I had control over the design. 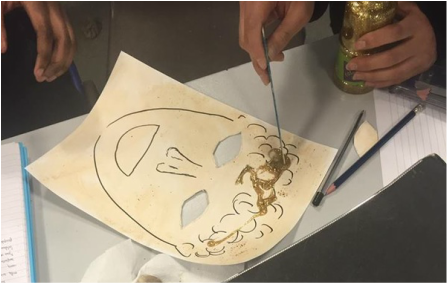 My lesson plan had some faults and flaws but the major intention of it was to be as creative as I could whilst staying within the parameters of the lesson and to grant the class the chance to learn interactively whilst having fun. The class seemed to love the idea of being split into three teams for a game in which they compete against each other with it inspiring full concentration, even with members of the class who sometimes struggled to stay focused and on task. The fact that each team was given a student teacher as captain only seemed to make the games more competitive and enjoyable whilst also aiding in controlling the class during such a hectic set of activities. The game created a sense of controlled progressive chaos with the children eager to learn in an effort to give their team the win. I loved this lesson as I was not a team captain which meant I was roaming around making sure that the pupils were enjoying themselves whilst learning, which provided me the chance to see my game in action. Despite the fact that I loved my experience teaching there were aspects of the classroom which I found myself struggling with at first. The most prominent of these issues was dealing with potential SEN pupils as I had no understanding or knowledge of the best ways in which to hold their attention and keep them on task. As the placement continued I found that the better I knew the children the easier it was to keep these pupils on track, this was also aided by the fact that I catered to individual learning needs more by personally providing a more diverse and inclusive lesson plan which got everyone involved in completing fun activities. These experiences made me pleased that I took part in the module as it has provided me a very firm base upon which I have decided that teaching is the profession I wish to pursue. I am very grateful to the teacher and the Primary school for the opportunity they provided me and my group, and hopefully we can get back there next term. No lectures on Monday: I think it’s something that most students can’t wait to see on their timetable. I’d lucked out and got this miracle day. One day extra on the weekend meant a few more hours sleep, less pressure around deadlines and an extra few hours where I can decide my schedule. Tuesday looked pretty sparse too with only my teaching module in the morning. I had managed to download my timetable at a friend’s house the Friday before the term started. With the internet yet to be set up in my flat I wasn’t entirely sure what was going to happen in the teaching module but I got myself in on Tuesday morning for the first lecture of the term nonetheless. As I walked in half the class was talking about the lesson they had taught on Monday; everyone else was talking about how they’d prepared for theirs. Panic started to build: how had I missed something already? When it hit me that they meant lessons they had taught I went into full on panic mode; externally of course I kept my cool: never let anyone know you are the only one in the room whose messed up my brain told me. I borrowed a laptop to check what everyone was talking about. I logged into my email and saw the teaching schedule had been posted a while ago. I was certain I’d missed a lesson on Monday; surely this was some kind of cosmic justice for an otherwise free day… As it turned out I was due to have my first lesson that afternoon, an hour after this lecture ended. I hadn’t researched the subject or prepared any notes but there was still a chance to make it: I hadn’t missed anything yet! Somehow that first lesson went without any issues. I managed to get some research in on the drive over and it was luckily stuff I knew well. I made it to my first lesson. It was fun, we got to know the classroom, the teacher was lovely and the pupils were well behaved. We introduced ourselves, went over the planned materials and even had a small play of Romulus and Remus performed. I still remember one of the pupils' outrage that, having put his hand up too fast he had volunteered to play the part of “a giiiirl” (his emphasis). Overall it was a great introduction to the class and massively reduced the stress that had been building until that moment. As the Tuesday afternoons rolled over we got to know the class better. There was a slight lurch when the name badges were removed a bit too early for my liking but it worked well. Our group arrived, rarely early but never late, and peeked through the window. A couple of pupils would notice and a hush would go through the room until the teacher allowed us in. We were lucky to get a well behaved class, not that it couldn’t get hectic, but they were eager to learn. They enjoyed time-travelling visitors such as Wollos the Celt and Titus the Roman though they were never quite fooled as they proudly told Harry and Tom (my fellow teachers) when they returned next week sans costumes. Around the 4th week we sent them home with some simple homework. A template to be cut out which would form a paper gladius which they could bring in next week. Little did we expect that next week we would not be greeted by some paper swords but rather find out that a couple of them had gotten a little overexcited. Some fathers had clearly gotten involved when their children came home and said “we need to make a sword for next week”: there were more than a few miniature wooden swords but the crowning achievement was one father-son team who had returned with a wooden claymore about the height of me. An amused teacher had rounded these up as they had come in that morning and we briefly announced a winner and runner up for best sword rather than the battle re-enactment we had planned. We began introducing new concepts and were amazed at how quickly they soaked up information. 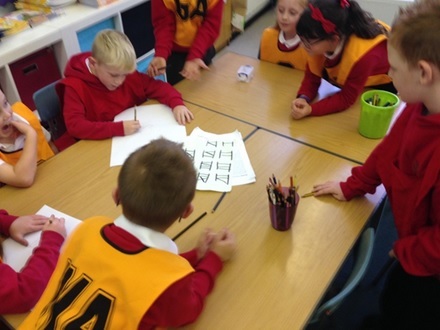 One section of work on Roman numerals the week before and they were ready to do maths using them the next. Seeing improvement was one of the most satisfying parts of teaching. One student who had insisted she could not read asked for help while I was leading the class. I asked her to keep her finger under the words and to follow along. If she put a mark near difficult words I would help her with them once I had finished leading the class in the reading exercise. I kept an eye on her and was pleased to see that she did as asked and was following on perfectly. A couple of red marks at the end were quickly resolved and she informed me as she left class that day that she beat the rest of her table in the comprehension questions. 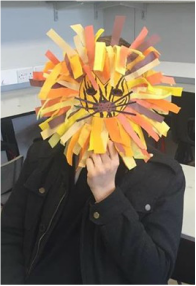 I wanted to write this blog about the best moment I had while teaching over the term. I didn’t want to single out one moment or sound cheesy and say something along the lines of “all of it was great.” I think the thing I look back on most fondly isn’t any discernible moment but rather that now, as I look back on it, I wound up spending my Mondays looking forward to heading back to school for Tuesday afternoons. Eurgh, isn’t that sickly sweet. Taking the Teaching Ancient History module was a bit of a gamble on my part, as I had not taught before and did not know if I wanted to train to become teacher after my time at university or not. Luckily this module was available and I thought that it would be a perfect opportunity to find out for myself. At the preliminary meetings and training I was apprehensive of my first class ‘on the job’ due to my inexperience and this feeling only grew as the first day of teaching approached. But in hindsight I do not know what I was worried about as the pupils in the class were delightful and very enthusiastic and even though there were 35 of them we managed to retain their attention throughout the lesson. As I left that first lesson I was already looking forwards to the next as we would have to dress up as Romans and Celts so the class could ask us questions. I was chosen to dress up as a Celt and this proved to be rather humorous as after that lesson, when I was back in regular clothes, I was constantly asked if I was the Celt in disguise. Early on in the project I mainly helped a table of low ability students, and later on in the project I mainly helped a table of higher ability students and the difference was profound. It really brought home to me the need for different worksheets and activities within the same class: if a single worksheet was produced the high ability group would often finish the work on their own and would only need help if they came across a word they did not know, whereas the lower ability group would need to be guided through each individual question, reading it as a table and then going back through the worksheet to find the correct answer and then encouraging them to phrase it as a sentence and then to write it down. This also applied to the SEN pupils that would join us for the class as they were spread throughout the class so there was one at each table. What warmed my heart about this was that often if the SEN pupil was struggling with a question or some work, the other pupils at the table would help them and explain the question or help them find the answer. When combined with the outside support given by the dedicated SEN teacher, who would go over the worksheet again with them in another lesson when we were not present, I feel that we provided an excellent learning environment for all the pupils in the class, no matter what their ability.